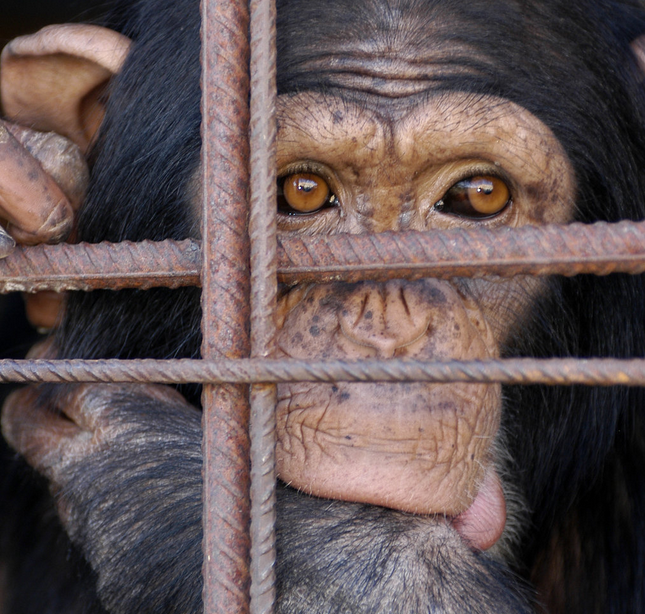 Last summer, an international group of scientists signed a declaration stating that all mammals (and some other animals) must be understood as conscious beings. I agree and not because elite scientists (finally) say so, but because the evidence is overwhelming. Clear signs of post-traumatic stress disorder (PTSD), a type of anxiety disorder, have been identified in elephants. Gay Bradshaw and colleagues wrote in Nature that young elephants who witness poaching or other "culls" (killing) of their close family members become "high-risk candidates for later disorders, including an inability to regulate stress-reactive aggressive states." Witnessed trauma, as this new article from National Geographic makes clear, can lead to nightmares later on in elephants. Well, here's a brilliant series unjustly neglected, left on the rubbish bin of TV history when it's every bit as good as Sherlock. It's mining a different vein, so we're not going apples-to-apples here, but both are detective series featuring a daft genius with a more socially adept partner/sidekick solving crimes in their own inimitable fashion. With Dirk though, there's a direct line to it's sci-fi roots in the Douglas Adams books although the series is a rather loose adaptation. Sherlock is flashier and more worshipful of its brilliant character ... Dirk is much less stylish, but a bit more sophisticated in the construction of its mysteries. Anyways, I'm not trying to set up a Dirk v. Sherlock debate, there's more than enough room for both and the problem I'm trying to stir interest in is that only the flash one is actually still in production. I'm watching Dirk on Amazon, where it seems like a natural fit and could easily replace Chris Carter's rather grim and soulless The After in the online giant's stable of pilots-longing-be-series. 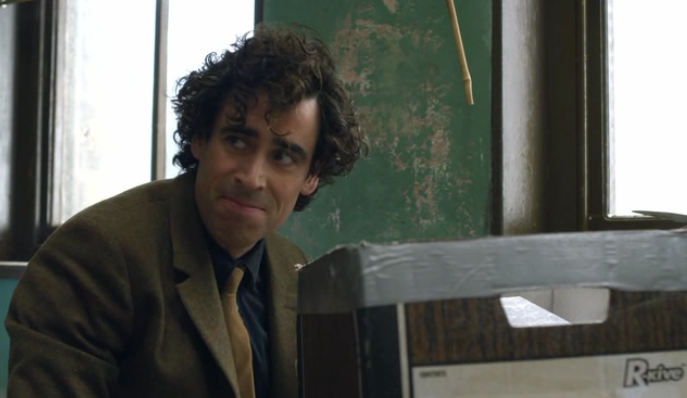 We're a few years past its end, but if Stephen Mangan's comments are any indication, I shouldn't think it would be that difficult to get him back if the production team could be restored? Judging by the cobwebs on the Bring Back Dirk Gently facebook page, I'm not exactly representing the views of a silent majority, but it does give me the idea to see if any interest could be mustered even at this late date in agitating for Amazon, or Hulu, or Netfilix, or HBO, or FXX or some network producing new episodes. Hence, a new facebook page to promote the goal: Bring Back Dirk Gently! Gridlock - "They're all gone now. My family, my friends, even that sky." New New York's got a bad case of the crabs after a drug binge spread a virus (in seven minutes?!) that wiped out most of New Earth. The Face of Boe sacrifices himself to help the Doctor free the survivors from the undercity gridlock and sets the stage for the return of the Master when he utters his final secret to the Doctor: "You are not alone." This is a bit better than "New Earth" but probably makes even less sense. Self-replicating fuel, the seven minute virus, Boe as a battery ... it doesn't hang together very well. It's saved by the Doctor finally speaking truthfully to Martha at the end, which takes the edge off what jerk he's been to her up that point, and by the wonderful device of having the Doctor drop into the mobile homes of a cross-section of New Earth society as he tries to make his way back to Martha. All those little scenes of domestic weirdness are a wonderful way to embrace the diversity of what makes people happy and gives unusual depth to world in which we've been dropped. Those crabs menacing the fast lane at the bottom of the motorway ... they're Macra. "Macra!" the Doctor gawps. Meaningful to him, but not so much to those of us who aren't old enough to have seen that lost story when it was broadcast. Crab creatures from the smoggy depths is all they are and, that's fine, but how did they get there again? There's a thing that Davies does here that I want to like more than I did because it's a thematically nuanced look at religion in society. The hymns uniting the society that's stuck in the motorway are touching and they serve an important purpose. Brannigan, the cat half of the cat-human family the Doctor encounters upon entering the motorway, puts it well when he says: "You think you know us so well, Doctor. But we're not abandoned. Not while we have each other." And he's right, they're getting by and their daily moment of contemplation is key to that. Humanity (and the cat people) need these affirmations that they are all in it together. And yet, they don't question why they're sitting in gridlock for years. They agree not to talk about the scary stuff, to not face the truth of their situation and work together to try to get out of it. Instead, they use this beautiful hymn to cement their complacency, to comfort themselves in docility to authority. Atheists, it seems, tend to focus on the latter aspect of the religious temperament while discounting the power and, dare I say it, the glory, of the human spirit expressed through those moments when people raise their voices in song together. "Gridlock" gets this complexity about right. The message is clearly, "Don't be sheep," but it is cognizant of the beauty of the song, or at least of the act of it being sung en masse. A little too cognizant, perhaps -- and this is why I don't like it as much as I want, despite being exactly what I think Doctor Who does well when embraces humanism -- I wouldn't have had Martha shed a tear and sing along. That was more than a bit much. Doctor Who and the Silurians - "This other species has developed its own civilisation. We must accept them as equals." This is, to a great degree. Doctor Who for me. What I mean by that is, while this story isn't best the show has ever done, it's an exemplar of what the show could be, week in and week out. It's got this great sci-fi idea that examines dilemmas societies have faced, and will continue to struggle with for the foreseeable future, and it presents that idea in an engaging story that works on different levels. We've got characters, both "good" and "bad" with motives we can understand on both sides of the conflict. It's also pure Who in that it's got: guys in rubber suits with electronically altered voices (well, one voice actually), an unconvincing dinosaur, dubious cave sets, debuts the series' use of CSO (the bête noire of the True Believers and casual viewers alike), sounds wonky (not sure if using someone other Dudley Simpson for the incidental music worked here or not), and feels a bit padded. Like I said, this isn't "The Brain of Morbius" or "The Ark in Space", where you're just blown away by how great it is, but it is one where you come away from it thinking it was better than any show with guys struggling to see where they're going in costumes that aren't fooling anybody has any right to be. The great sci-fi idea that Terrance Dicks came up with here was to twist the dials on the alien invasion story to make it so the aliens are actually from here, are not actually aliens, and they're not here to conquer because they're aggressive. They just want their world back. 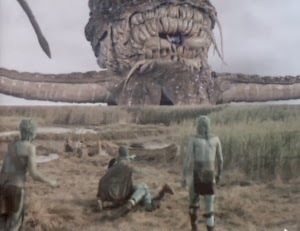 The Silurians were an advanced civilization -- let's be deliberately vague here to get around the impossibility of the timelines -- during the time of the dinosaurs who detected an incoming planetoid that they determined would cause catastrophic damage to the Earth when it impacted. They put themselves in suspended animation deep underground to wait out what would otherwise have been an extinction event. They awoke later than intended to find the filthy apes had evolved and taken over the world. Their world. There's more to the story than just this, there's commentary on government bureaucracy and scientific overreach, but just that one nifty premise sets up a solid story. What makes it better, what makes it Doctor Who, is how the Doctor meets a Silurian and, instead of being driven mad from fear, or reacting defensively, or with outright hostility, or with self-serving greed, the Doctor meets a Silurian and extends his hand in friendship. Humans and Silurians are in a precarious position, they both want to dominion over the planet. Humanity has it, the Silurians want it back. On both sides there are level heads open to solving the problem by negotiation and compromise, and on both sides there are belligerent fools. The Doctor takes it on himself to try to prevent a war and shows what bravery really looks like. It's not reaching for a gun; it's encountering the Other and making the first attempt to open a dialogue when the first instinct is fight or flight. Now, in the end, it all goes south. The Brigadier seizes the opportunity to blow up the Silurians once he thinks the Doctor is out of the way. I'm a fan of the character. I named one of my dogs Brigadier because I love Nicholas Courtney in the role. But this is the Brigadier's worst moment. Sure, he's on humanity's side, but what he does is absolutely inhumane and the Doctor, bizarrely, never makes him accountable for his actions here. And yet, as awful as this ending is, as awful as it reveals the Brigadier to be in that moment, it's a fitting end. It keeps the history of the world on a track that is recognizable. Much later in the series, when Ten lets Harriet Jones have it for what she did to the Sycorax, I think the series acknowledges that this is terrible, and it's also our nature, and gives the Doctor a chance to express his condemnation of the fearful regression to violence a bit more forcefully than Three's grim acceptance of it here. (And, of course, the Doctor will get a chance to encounter this emergent Silurian threat to humanity again in "The Hungry Earth"/"Cold Blood". I generally watch the stories in one sitting these days, unlike when I was kid watching them daily, an episode at a time, on public television, so this one being split over two discs means I had to wait for the ending after sending disc one back to Netflix. One thing this does is remind that these stories weren't made to be watched in a single sitting. The structure of the cliffhanger every 25 minutes or so feels different when you watch the resolution a week later. Sandifer discusses this throughout the Eruditorum, but it's one thing to read it and another to re-experience it. I'll never finish this project if watch an episode a week though so binge watching and its attendant distortion of the experience are a necessary flaw in my scheme. Let's get the "his name is Doctor Who" thing out of the way. The Doctor's surname is no more Who than his given name is Doctor. It certainly isn't in the new series nor was it in the classic. The title of this episode was a mistake by the graphics group in putting the title card together. That's per the infotext on the DVD release and, while individual writers may have been confused here and there, the production team deliberately fixed any accidental references to his name being Doctor Who so that he was called simply 'the Doctor'. It's settled. Whatever his 'real name' might be, it's not Doctor Who. The Power of Kroll - "I can tell by the expression on your face that you're putting two and two together." Watched this story in the midst of watching "The Silurians," a two-discer which means there's a week between Netflix deliveries, so the handling of colonialism and empire in Doctor Who are fresh in mind due to the themes of that early Hulke-penned Pertwee story. But, most of us don't watch the show for insights into popular, or emerging, attitudes towards empire as packaged for family viewing by early- to mid-1970s British watchers of Saturday tea-time telly. At least not primarily. And, I'd have to lean pretty heavily on folks with more direct or studied knowledge of that particular dynamic anyways, so my approach to discussing this one naturally tends more towards how it feels to watch it today, as an American in 2014 with scant awareness of the socio-political climate of Malcome Hulke's and Robert Holmes's Britain. This is far from the most entertaining of stories of Tom Baker era. Like "The Stones of Blood," it's a bit of a dud in terms of entertainment value within the Key to Time season; however, also like that one, it's not without certain charms. The charms here are, as is usually the case, Tom Baker's charisma, seeing John Leeson (not just hearing him as K-9), and the fun of watching a rubber squid attack a model of a methane refinery rig and menace a swampy marsh from the top half of a less-than-subtle split screen. The Swampies, our stand-ins for earth-bound aboriginal peoples who've been relocated to make way for the "civilized" folk, are a bit uncomfortable to watch. Holmes makes it clear they're fully human and deserving of the same consideration as the more civilized methane miners. Yet, they ignorantly worship a giant squid and don't know which is the business end of a rifle despite protestations to the contrary. If they were all ignorant and bloodthirsty, the valuable politics of this story would have been obscured. Luckily, just as the crew of the refinery are not a monolith of contempt for the humanity of the Swampies, the Swampies also have individuals that recognize the profound silliness of their squid-worship in light how indifferent the giant squid is to their devotion, not to mention the small-mindedness of their High Priest. THAWN: Don't you worry about the Swampies. We'll look after them, provided they see reason. DOCTOR: What, teach them to carry trays? FENNER: Why not? Tell me, would you let a small band of semi-savages stand in the way of progress? DOCTOR: Well, progress is a very flexible word. It can mean just about anything you want it to mean. "Progress" is not "profits," or "more resources for one population at the expense of another". Sure, that definition looks like material progress to the beneficiaries of its application, but when we talk about about "progress," if we're not talking about progress towards achieving a society that treats everyone fairly, one that values and practices justice for all, then "progress" is just another word appropriated to justify exploitation. Holmes, like Hulke with "The Silurians" is squarely on the side of justice for the Swampies, even if the portrayal of their culture comes across a bit high-handed; it's comforting that when the story isn't firing on all cylinders -- not that this one is ever terrible, just bogged down a bit -- it's at least cleaving close to the best of the show's humanist principles.